Our company is highly esteemed firm known for offering Rubber Septa to the clients. This product is made using quality tested raw material and latest technology by our highly skilled team of professionals in order to attain complete customer satisfaction. 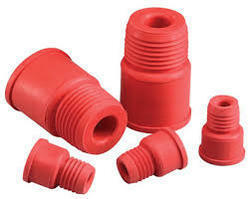 Rubber Septa is offered in different dimensions, sizes and specifications as per client requirements. Offered range is highly cherished by the patrons. Incorporated in the year 2010, Nsil Lab Glass Works Private Limited is engaged in manufacturing, supplying and trading a large assortment of Laboratory Glassware, Adapter T connection, Laboratory Stirrer, Laboratory Ware, Pear Shaped Flask and many more products. We are Private Limited Company which is providing products to the customers as per their needs in order to satisfy them. The products of our company are highly demanded in the market for their long lasting life, accurate dimensions, fine finish, effective usage and many more attributes. The products we offer are made by our professionals from best quality material that we source from leading vendors of the market. Our offered products are highly acknowledged amongst the customers for their usage in laboratories and many more application areas. The products we offer are available as per the industry standards and at market leading prices.